The Sahara Desert extends eastward from the Atlantic Ocean some 3,000 miles to the Nile River and the Red Sea, and southward from the Atlas Mountains of Morocco and the Mediterranean shores more than 1,000 miles to the savannah called the Sahel. Atthe European Geosciences Union General Assembly held in Vienna, Austriaearlierthis year, researchers presented new evidence showing that the easternregionof the Saharadesert, particularly the area near Lake Yoa in Chad, dried upslowly and progressivelysince the mid-Holocene period. "Thefindings of this study are that the sedimentological and geochemicalpropertiesof the lake sediments confirm that the Sahara has been drying slowlyfrom sixthousand years ago to reach the present day conditions around 1,100years ago,"said lead author Pierre Francus, professor at the National Institute ofScientific Research in Quebec, Canada. Inthis latest study, researchers analyzed the sedimentation in Lake Yoaon ayearly basis and dated it to determine when and how the Sahara regiondried-up.Other studies have used climate modeling to determine the time periodthat theSahara went dry and the prevailing climate conditions at that time. Thewidely-held belief is that the Sahara dried up due to a change in theEarth'sorbit, which affects solarinsolation, or the amount of electromagnetic energy the Earthreceives fromthe sun. In simpler terms, insolation refers to the amount of sunlightshiningdown on a particular area at a certain time, and depends on factorssuch as thegeographic location, time of day, season, landscape and local weather. Climatescientist Gavin Schmidt, of NASA's Goddard Institute for Space Studies,explained that around 8,000 years ago, the Earth's orbit was slightlydifferentto how it is today. The tilt changed from around 24.1 degrees to thepresent-day 23.5 degrees. "Additionally,the Earth had its closest approach to the sun in the northernhemisphere (with)summer in August," Schmidt said. "Today, that closest approach is inJanuary. So, summertime in the north was warmer back then than it isnow." Thechanges in the Earth's orbital tilt and precession(orthe wobbling motion) occur because of gravitational forces emanatingfrom otherbodies in the solar system. To understand exactly what happens, pictureaspinning top when it is slightly disturbed. Just like a top, the Earthtoowobbles slightly about its rotational axis. This tilt changes betweenroughly22 and 25 degrees about every 41,000 years, while the precession variesonabout a 26,000-year period. These cycles have been determined byastronomersand validated by geologists studying ocean sediment records. "Ifyou get a long enough time series that can be well dated, you should beable tosee frequencies in the data that correspond to the periods predicted bytheory,"Schmidt explained. Fora long time, the belief was that the Earth's tilt would change onlyinsignificantlyin the next century. However, recent research is suggesting that theeffects ofglobal warming?particularly the oceans?could cause a change in theEarth'saxial tilt. Scientists from NASA's Jet Propulsion Laboratory say thatthecurrent melting of ice in Greenland is already causing the tilt tochange at arate of approximately 2.6 centimeters each year. They predict that hischangecould increase in the years ahead. Thechanges in insolation caused by shifts in axial tilt have an impact onatmospheric weather patterns such as monsoons. Thousands of years agowhen thenorthern hemisphere received more sunlight, it also intensified themonsoons.After the Earth's tilt changed, the monsoons decreased and thevegetation beganto disappear. When there were no plants to retain water and release itbackinto the atmosphere, the rain progressively decreased. The resultingfeedbackloop between plant life and climate eventually created the currentdesertconditions. Thereis now considerable evidence to show that the Sahara used to have agrasslandecosystem and was a much wetter place than it is now. However, thedebate abouthow that transition occurred continues. The disagreement amongscientists is inpart due to the lack of paleo-environmental records from the region.Therefore,scientists must often resort to climatemodeling. In1999, German scientists used computer simulations to model the Earth'sclimatethousands of years ago. They concluded that the climatic transition oftheSahara took place abruptly, within a possible span of about 300 years. Nearlyten years later, another group of scientists studied the environmentalchangesin the northern Chad area during the past 6,000 years and came to theconclusion that the Sahara underwent a more progressive drying-upprocess. Schmidtbelongs to the group of scientists who think there is evidence forsuddenchanges in the Sahara. "Giventhe very strong dependence of vegetation on water availability, the endof the 'GreenSahara' came about quite suddenly around 5,500 years ago," Schmidtsaid. "Thus,a very slow change in the orbit (led) to an abrupt collapse in thatecosystem." 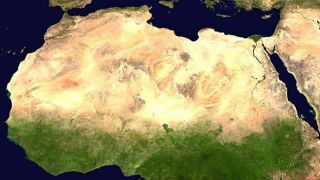 Sincethe Sahara spans a massive area?covering nearly a third of the Africancontinent?it is quite possible that parts of it dried up abruptly whileit tookother regions a longer period of time to transform into a desert. "Itseems that drying was progressive in our area, but it does notautomaticallymean that it was the case in other areas such as Western Sahara," saidFrancus. "We cannot rule out completely the possibility of abruptdrying.Understanding the regional differences in climate change is the nextchallengefor climate scientists." Francusexplained that abrupt climatechanges have been documented in many places on Earth atvarious times inthe past. One example he cited is the Younger Dryas, one of the mostfamousexamples of abrupt climate change that occurred between (approximately)12,800and 11,500 years ago. According to the National Oceanic and AtmosphericAdministration, the end of this period was particularly abrupt when,forexample, in Greenland, temperatures increased 18 degrees Fahrenheit inabout adecade. "Manyscientists think that abrupt climate changes are possible in thefuture, butthe nature, direction and intensity of these changes will most probablyberegion-dependent," Francus said. Francusalso noted that there are some models that cannot predict an abruptclimate shiftat all. Some scientists feel that there is not enough knowledge tounderstandthe processes driving these changes primarily because it is difficultto modelthe soil moisture and cover. Regardlessof whether the Saraha dried up gradually or suddenly, most scientistsagreethat it is important to understand how the climate changed in the pastand whatkinds of natural forces affected those changes. That will help climateresearchers determine the precise role human behavior plays on currentclimatechange. "Themodels that are used to predict future climate need to be tested, andusinginformation from the past is one way to achieve this goal," Francussaid.